COLLAR HARVEST - Did you ever wonder if it was legal to shoot a big game animal if it had a radio collar or ear tag? Well, here is what Oregon is telling it's hunters for the 2005 season. Oregon Department of Fish and Wildlife biologists remind hunters they can legally harvest radio-collared and ear-tagged deer, elk, cougar and bear in southern Oregon, provided they have the appropriate tag. Biologists have radio-collared and ear-tagged a number of deer, elk, cougar and bear throughout southern Oregon as part of on-going wildlife research projects. Both buck and doe deer, along with bull and cow elk can be seen with collars or ear tags. ODFW asks hunters to return the radio collar or ear tag to any ODFW office along with the date and location the animal was harvested. A CIRCUS BEAR - Every once in awhile I will get some pictures emailed to me that I think would be good to share with our readers. Click the link below to look at a series of pictures which I think you will find well worth your time. Something about the third picture just made my wife and I roll with laughter. HUNTS FOR JUNIORS - The California Deer Association is once again holding a free drawing open to the public for junior hunters. The drawing is for 15 antlerless deer tags on the Tejon Ranch in Southern California. Last year 10 junior hunters were drawn for the Sharing the Tradition hunts on the Tejon Ranch and all had successful hunts. Each junior hunter received ammunition from Winchester Ammunition and a pair of Tasco binoculars from Bushnell Optics. This is an outstanding, fully-guided hunt on a 270,000 acre ranch with first-class accomodations. All of the juniors and their adult companions will stay in one of two excellent lodges on the ranch. For more details about the drawing, click the link below. OUTFITTER SHOT DOWN - This past year we have seen Fish & Game Offices scrambling to figure out what to do about nonresident hunters as a result of lawsuits filed in Arizona and Nevada. Well, it looks like Nevada has cleared the decks with the lawsuit from an outfitter being tossed. For the complete story click the following link Shot Down. DEER DRAWING STATS - Wonder what it took to get drawn for a California X Zone Deer Tag this year? Well, if you had the maximum of three points this year and applied for one of the X Zones listed below you were a sure thing to get drawn. ARIZONA SAYS NO - A proposal to give out Conservation Bonus Points to help in the Big Game drawing to those who did extra work for wildlife has been shot down. Click No Points to read about it. DRAWINGS - If you have been reading Across the Campfire, you know I didn't have any luck in this year's drawings, neither did our Northwest Field Editor from Idaho, Long Walker. But the news it's all bad. Here is an email I received today from one of our readers. "I hit pay dirt in Wyoming with an elk tag, antelope in Unit 89 and H zone for mule deer! BBQ at my house this winter! "Bridging the Wild and the Sophisticated"
ARCHERY SEASON OPENS - If you are a California bowhunter you probably have grabbed your bow and your t-shirt and headed for the woods today. If you are not a bowhunter you might ask why a t-shirt and also, bowhunting in July??? Yes, California has a very early bow season for deer but it also includes heat and lots of it. Just last week tempertures were over 100, but for the opener today they may only be in the high 80s. But don't worry, the 90s and probably 100s will be back within the week. The standard camo for bowhunting in California is the t-shirt because of the heat, that is unless you are hunting every close to the coast. You also find that by 8 a.m. most of the deer are headed for their beds if not already in them. When the late season for archery begins the third weekend of August in California, bowhunters have a chance to head for the high Sierras which allow them to wear more of a camo outfit for those cooler mountain mornings. Whether it is cold, cool, warm or hot archery deer seasons are too much of a challenge to miss no matter what the weather. If you have never hunted with a bow you are missing out on one of the most exciting ways to hunt. Why not extend your hunting season, check out your archery options today! ZERO FOR ME - Yes, that was the result of my attempts to draw tags in Oregon, Idaho, Nevada, Wyoming and California. I have one last chance for a raffle for the tule elk cow tag being raffled by the California Deer Association (CDA) in August. But with my luck it will just be another donation. CDA is again putting on the Sharing the Tradition junior deer hunt drawing for the Tejon Ranch. Last year 10 hunts were given away, this year it will be 15 hunts. I will have information on the drawing shortly. This is a fantastic hunt for juniors and the adult that accompanies them. I have a new BowTech bow on order which should be here within a week. It is the new Allegiance VFT. I'm excited about its new BINARY CAM System. I'm also going all the way and switching to carbon arrows. DEAR UNSUCCESSFUL - How many of you have already received this greeting from Fish & Game Departments letting you know that you were unsuccessful in their big game drawing for this year? I got the bad news from Idaho this week that I wasn't one of the lucky ones in the Super Hunt raffle drawing. It was interesting to see that one hunter from Marysville, California was drawn for a Super Hunt deer tag but like the Oregon special raffle, most of those drawn are residents of the states that are having the drawing. In the Idaho raffle only one California hunter, one Oregon hunter, one Washington hunter and finally one Nevada hunter were drawn for the 26 total tags. All the rest went to Idaho hunters. In fact, one Idaho hunter was present for the drawing and his name was drawn for an antelope and an elk tag - he needs to go buy some Lotto tickets. Well, I'm down to the final draw - California. Still have my fingers crossed for next week! 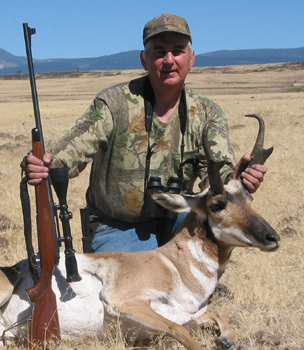 WIN A TULE elk cow hunt. Here is your chance to help the California deer herds and also give yourself a chance at a great hunt. For complete information click the link below. NEVADA DRAW. Well, I got my email from Nevada today telling me I was unsuccessful in drawing for mule deer and antelope. I still have my fingers crossed for the Idaho drawing tomorrow and the California drawing on June 24th. HUNTING OPPORTUNITY. The California DFG has announced the hunt schedule for the Carrizo Plain for 2005/2006. Chimineas Unit of the Carrizo Plain Ecological Reserve is a new opportunity for hunters. For more information on this hunting opportunity, click the link below. For those of you who put in for Arizona, June is also your month to cross those fingers. For those who love to hunt with stick and string, California's first archery deer season begins the second weekend of July so you should already have shot a lot of practice arrows into those targets. FOR THE DOGS and you, that's the June 4th Gun Dog Handling Clinic. The California Department of Fish and Game is putting on this daylong clinic as part of it's Advanced Hunter Education program. It's training techniques for hunting dogs featuring some of the best and most experienced dog handlers in the country. DFGs Gun Dog Handling Clinic will offer hunting-dog owners instruction from some of the best handlers in the field. The clinic on June 4 runs from 8:30 a.m. to 5 p.m. at the 4 Seasons Hunt Club in Tehachapi. Cost is $40, and space is limited. Advanced Hunter Education program coordinator Susan Herrgesell said because DFG has brought in top gun dog handlers to teach participants, the clinic promises to be a fantastic learning experience for participants. There will also be opportunities to watch some of the best gun dogs in action.  Featured instructor is Dez Young and his Llewellin Setter, Dash. The duo host the Outdoor Life Networks television show Upland Days with Dash and Dez, and will present Training from an Amateurs Perspective during the clinic.  Instructor Bryce Mann has more than 24 years of experience training gun dogs and is a member of dog-training equipment manufacturer Team Tritronics as one of its featured seminar trainers.  Four Paws Kennels owner/operator Chuck Breslin will share his experiences as a breeder, trainer and field trial judge to help everyone from the novice to the most experienced hunter better understand gun dog breeds. He will offer instruction on how to select a breeder, what to look for when picking a puppy, and much more.  Veterinarian Danette Weich has made a business of breeding, training and hunting with pointers and retrievers. She will discuss dog care and advise how to ensure dogs are in top condition for training and hunting. She will also instruct on field first aid so that hunters can deal with common injuries dogs experience when working at peak performance.  Dave Hamilton of Guns & Roosters Hunting Preserve will talk about field considerations and gear, and will discuss regulations that apply to training and hunting with a dog. A barbeque lunch will be available for $5. A registration form can be printed from DFGs webpage at www.dfg.ca.gov/coned/huntclinics. WE ARE UNDER attack! If you live in California, you are under attack more than ever before. Here are just two of the bills introduced in Sacramento. AB 1002 would ban the possession of any ammunition other than nonlead ammunition while hunting in known or likely ranges of the California Condor. Also, included in the bill is the phase-in for the entire state of this lead ban by January 1, 2009. Not only would this make major changes in the ammo you use for big game hunting but you would need to forget ever using your .22 again. Commencing July 1, 2007, any person who possesses in any public place any handgun ammunition that is not serialized is guilty of an infraction punishable by a fine not exceeding five hundred dollars ($500), or is punishable as a misdemeanor. (A) Ammunition as defined in subdivision (a) of Section 12323. (B) .22 caliber rimfire ammunition. (C) Assembled handgun ammunition packaged for retail sale. (D) Bullets used for reloading or handloading handgun ammunition that are packaged for retail sale. Can you think of what the cost of a box of .22 shells would be if each bullet had to have a serial number on it? Plus, any handgun ammo you had now would make you a criminal. The lawmakers in California are going crazy with all these bills whose real intent is gun control. Those of you who get either of the NRA publications, American Rifleman or American Hunter, should read the latest editorial, "A Thousand Cuts." OK, ranting and raving will not fix the problem. We all need to be active and start calling and writing these misguided people in Sacramento. Now for a more pleasant topic. GEORGE'S HONEY HOLE  My son and I had a chance to turkey hunt with George Carl this past Thursday in Lake County, California. George had invited us to a property which is a true honey hole for turkeys. Before fly down time we had four or five gobblers sounding off. After the birds were off the roost, George counted nine gobblers in a row coming his way. As the birds were coming into range a dip in the terrain gave them cover so that George could only see their heads bobbing up and down as they passed by in range, but on their way off the property. We counted at least another three gobblers in another area plus one George estimated had a beard of 13 inches. We did our best to call the birds in but just could not get them over the line onto the property we had permission to hunt. It was the most exciting hunt of the season for us. There is one week left of season and if the schedule works out, we may be able to take one more crack at George's Honey Hole. THOSE DEADLINES Well, I went on-line this afternoon and put my application in for Nevada mule deer and antelope just before the 5 p.m. deadline. This was really not a good idea because there could have been a technical problem and I might have missed out. I lucked out, the Nevada system is a real simple system, I just need to apply a day or two earlier next year. Last year was my first time to apply for a tag in Nevada and it cost me $142 for the nonresident license fee, which I had to pay if I wanted a bonus point for not being drawn. This year I realized I should go ahead and apply for antelope too because for just $15 more I could get a bonus point for antelope if not drawn (and you know what the chances of getting drawn the first time will be). So now one of the waiting games begin as I should hear by June 17th. Another chance I am going to take is the Wyoming Commissioner's License & Hunt Raffle. For $20 I will take a chance on winning a fully outfitted hunt with any member of the Wyoming Outfitters & Guides Association. The winner will also get the cost of a Wyoming license and tag. This drawing is June 1, 2005. For more information go to Wyoming Raffle. For California hunters, tomorrow I will update you on some of the crazy bills those guys and gals are trying to get passed in Sacramento, from banning lead bullets to attacking your semi-auto handguns. In California the nuts are not just on the trees. Finally, tonight, my family had some antelope steaks from my California antelope pictured above. I pulled out a bag of Juniperberry & Peppercorn Rub that I picked up at the ISE Show in Sacramento from WILDEATS Enterprises. Boy, it will be hard for me to cook those steaks without it in the future. Yum! JUMPING THOSE DECOYS  Well, my son and I were in the turkey woods this past Sunday. It was nothing short of just beautiful, the grass was covering the hills like a giant green carpet with patches of wild flowers sprinkled through out. Our wet spring had the creeks running full and it seems like every ravine had it's own little stream racing down to meet creeks. We did hear three different gobbles but those tom's just didn't want to come in our direction. Outdoor writer, George Carl from Napa told me he was out on Monday and just before turkey fly down time two coyotes jumped his hen decoy causing the birds to fly long and clear of the field upon which he was setup. In Lake and Mendocino counties many of the hens are now sitting on nests and the toms are on the prowl. On Sunday I hunted with my grandson near Lake Sonoma and we bagged two good toms. One weighed 20 pounds and the other 19. The birds responded to a call from nearly a half mile away. Ron Sneed of Lakeport has bagged all three of his turkeys using a bow which is virtually unheard of. The Cache Creek Wildlife Area is also producing birds. Finally, a weird thing happened to me. I put out a hen decoy to lure in a tom and a large red tail hawk came screaming out of the sky and attacked the decoy. It knocked the decoy end-over-end. Looks like the decoys work on more than just turkeys  now if I can just figure out how to get a gobbler to come running at my decoy before the season ends. LOTS OF RAIN  That's what we seem to be getting for the California turkey season. It's Saturday in central California and the light wind is pushing the remains of the storm that yesterday brought heavy rain and some funnel clouds in the afternoon. The snow level dropped to 2,000 feet in the Sierras. It looks like we should see some 70 degree temperatures tomorrow and if things go right, my son Scott and I will be in the turkey woods in the morning. I have that new Benelli shotgun I am itching to put some new Winchester Xtended Range Hi-Density shot through the barrel. The turkey hunting has been slowly improving in Lake, Mendocino and Sonoma counties. Ron Sneed of Lakeport took a trophy tom two days ago with bow. It had a 9 1/2 inch beard and weighed close to 20 pounds. Other hunters also report doing well. I went bow hunting on Friday and called in a big tom, but when I went to draw my bow the tom saw my movement and spooked. I worked several other turkeys during the day but none came in close enough for a shot. Upon my return home as I drove in my yard I noticed two toms standing in my bass boat. That's a true story. It's two weeks into the California spring turkey season and though it started slow (we are hoping because of the weather), all of the camo clan are crossing their fingers that those big boys are now struting like Thanksgiving turkeys and gobbling at any noise that they hear. GETTING AFTER COYOTES  I had a chance last week to slip a new DVD into the player, it was Operation Predator 2 from Hunter's Specialties. This DVD is a combination of hunts for coyotes intermixed with valuable instruction from four experienced predator hunters. I learned a lot and am anixous to try some of what I learn from the DVD, plus, I would like to drop some more coyotes before this year's does drop their fawns in May/June. SLOW IS THE word I continue to receive about turkey hunting in California. From Southern California, to Central California, and finally to Northern California those gobblers are running silent. Jim Matthews reports from Southern California that hunters didn't do very well opening weekend. He also reports a group of eight hunters at Fort Hunter Liggett in Central California only picked up one bird opening weekend. In checking with NWTF California State Chairman, Phil Martinelli, he reported gobbles from the roost on opening morning led to a nice gobbler for him after a fly down but two follow-up trips since then in El Dorado County have turned out to be completely silent. Let's hope this turn to warmer weather will get those gobblers warmed up too! TURKEY OPENER WAS not what we had expected. As my son and I rushed up the highway into the foothills of the Sierras east of Stockton, California, we realized we were at least 45 minutes later than we had planned. The sky to the east was showing some light as we listened to the Bob Simms Outdoor Show on radio station KFBK. We listened closely as Simms played a pre-recorded taped conservation with California turkey hunting guru, Terry Knight from the day before. Knight was telling how the turkeys around his home were still in groups of just hens and just gobblers. He said they were not responsing to his calls. He thought the reason for this action was all the rainy weather we have had the last few weeks. Usually, the birds are gobbling up a storm by the time turkey season begins. My son and I were hoping that Knight's description only applied to Lake County and not the county we were going to hunt this morning, but we were wrong. It is always nice to be in the turkey woods on the opener. After hunting all morning we had not seen a single turkey or heard even one gobble. We did see a couple of turkey tracks which looked like they were maybe a couple of days old. This was the weekend that I guided the two hunters on Wilderness Unlimited property on Spring Valley Ranch in Potter Valley (Lake County). There were plenty of birds but very few gobbles. I did manage to call in a nice tom for one of the hunters (a 21-pounder with a 9 3.4-inch beard.) and he shot it. The other hunter missed a shot. Mostly we had to sneak on the birds as they didn't want to respond to a call. So it looks like it was just as tough here. Here is hoping that because the turkeys started off slow, that they will kick it into gear as the weather turns more like spring. Bad news, I just looked out the window and it is starting to rain, again. Remember, if you are an archer, California this year has added two weeks to the end of the normal spring turkey season for archery only hunters. CALIFORNIA TURKEY HUNTING  A lot of California turkey hunters are glad to see the weather forecast of sunshine for the opener on the 26th. The last couple weeks of rain have made everything pretty wet. With most of the turkeys on private property, many hunters find it difficult to have a place to hunt. For those of you who are still looking we have found a unique opportunity which allows you to have a family trip and at the same time get in some turkey hunting. 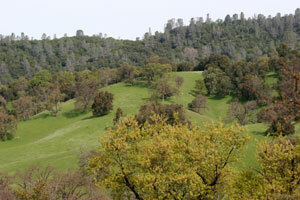 It's a beautiful time of the year near Angels Camp so if you want to know more about this possible hunting location, click the link below. A BENELLI BIRTHDAY  My birthday falls in the month of March. It has been a long-time (42 years) since I bought my last shotgun. It was a special order Remington Model 870 pump with a 28-inch barrel including the Poly Choke (if you don't have gray hair you probably are asking yourself, "What the heck is a Poly Choke?"). I can't tell you how many times I have racked the forearm back and forth on that sweet gun. Many an animal has also heard the sweet sound of that action  doves, quail, pheasants, chukars, turkeys, ducks, geese, snipe, crows, rabbits, etc., plus clay targets. But with the advent of 3-inch and 3 1/2-inch shells and steel shot, over the years I have missed the opportunity of using them with my chamber only suited for 2 3/4-inch shells. Now, I still have taken my share of game with that 870 but because of the lack of camo in the turkey woods and watching some hunting buddies with their Benellis, I thought maybe it's time to break that 42 year shotgun drought. My wife has a new Benelli Super Black Eagle II, ComforTech in Advanatge Timber HD camo on its way for my birthday. With a barrel length of 26-inches she also included the three brand-new CrioChoke tubes for turkey, pass shooting and decoy shooting. With these three chokes and the other five standard chokes I will probably get a brain cramp trying to figure out which one to screw in. For those of you who haven't reached the graying stage in your life yet, the Poly Choke is a single unit attached to the end of the barrel. It has six choke settings and you just twist it to the one you like  easy and fast. So if you see me in the turkey woods this season you will know if my new Benelli arrived because it is easy to see the difference between a camo shotgun and one with wood and blue barrel. But don't worry, after 42 years with such a faithful hunting companion the 870 will still be one of my hunting partners, it may just spend a little more time with me in the hands of my two young grandsons. DEADLINES  MOVE fast or you will miss out on the opportunities to apply for these hunts. SOME TIMES THE wolf doesn't aways win. The following report came to us from Idaho. Conservation officers in southeast Idaho found a young female wolf injured so badly they were forced to put it down. The officers were responding to reports by mountain lion hunters about signs of wolf activity in the Big Bend Ridge area northwest of Ashton. On Thursday, February 24, senior conservation officers Bruce Penske, Charlie Anderson and Shane Liss set out on snowmobiles to search the Sand Creek Wildlife Management Area for wolf tracks. Once they found a lone set of tracks, they continued on snowshoes tracking the wolf for about two miles. They eventually saw the un-collared wolf dragging its hind quarters. The officers eventually caught up with the animal in a steep canyon where they got close enough to determine that it was severely injured. Using cell phones, officers conferred with Idaho Fish and Game and United States Fish & Wildlife Service (USWFS) officials to receive the proper authorization to put the animal down. The officers were able to get close enough to the animal to use their department sidearms to dispatch it. Upon closer investigation, the animal not only appeared to have a broken spine, but was missing an eye and had injured paws from dragging itself. There is no evidence to suggest humans injured the wolf. Investigators believe the injuries may have been caused by a moose, but the exact cause is still under investigation, pending a necropsy.